Floral Marquise Pendant with Amethyst. Marquise cut amethyst measures 7mm x 13.5mm. Pendant length: 46mm (1 13/16") including bale (36mm without bale). 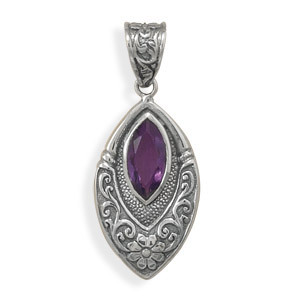 We guarantee our Marquise Amethyst Pendant in Sterling Silver to be high quality, authentic jewelry, as described above.